This watercolour, although not signed or dated, carries its title in Thomas Baxter’s hand. 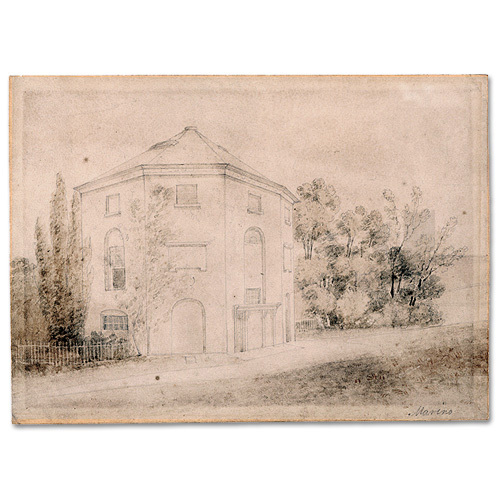 It shows the unique house, ‘Marino’, built for Edward King and his wife, Jane Morris (sister to John Morris, the industrialist) in 1784. Edward King was responsible for collecting His Majesty’s Customs at Swansea. The innovative architect was William Jernegan (1750/1-1836), who enjoyed a long and successful career at Swansea. In 1817, John Henry Vivian, owner of the Hafod Copper Works, leased ‘Marino’ and later purchased it, making only modest alterations initially before financing the major building scheme which created ‘Singleton Abbey’ around the original house. This Gothic-style building which began life as an octagonal marine villa sited to view Swansea Bay is now the administration building of the University of Wales, Swansea. Three of the original eight sides can still be seen. Although Baxter’s view of the house picks out many architectural details, the ornamental urn which sat atop the roof, serving as a chimney and which can be seen in earlier views is not depicted here.